Vanuatu Opposition bloc’s motion of no confidence against Prime Minister Charlot Salwai deposited with the Office of the Speaker Tuesday, is in order. Dated 12 June 2018, the motion carried nine (9) signatures, including the Opposition Leader MP Ishmael Kalsakau, MP Fred Tasso, MP Sato Kilman, and MP Joshua Kalsakau, MP Ephraim Kalsakau, MP Jay Ngwele, MP Mark Ati, MP Alickson Vira, and MP Issac Tongoliliu. Speaking to the Daily Post, Speaker Esmon Saimon confirmed receiving the motion Tuesday morning. He also confirmed that the motion is in order and has been registered. He said the motion will be tabled for debate in Parliament at 4pm on Tuesday, June 19. The Opposition Bloc has accused the Prime Minister of permitting his office to be called into question over the months and listed eight questionable acts. The first is allegedly introducing amendments to the Constitution that have been poorly considered and have erroneously not received the prior consultations of the people of Vanuatu. The second is introducing the prospect of an income tax which has allegedly failed in all respects to take into account the livelihood of the people of Vanuatu, potentially reducing the bulk of the population into further poverty. 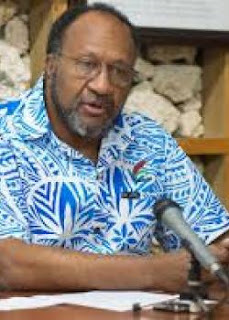 This is followed by allegedly erroneously advocating the PACER Plus in a manner that has never taken into account the need to first address the weakness in Vanuatu Industry such that the prospect will reduce Vanuatu to further poverty, and interfering with the independent operation of the Telecommunications and Radio Communications Regulator and her statutory office by attempting to suspend her twice, as well as allegedly violating the Leadership Code in his attempts to suspend the Telecommunications and Radio Communications Regulator. The Opposition says “harbouring the former Deputy Prime Minister who is convicted in the Government for over three months after he was convicted by the Supreme Court of Vanuatu” is another questionable action. The bloc also accused the Prime minister for allegedly interfering in the operations of Air Vanuatu (Operations) Limited through his instructions for the Airline to employ a young pilot from his home island of Pentecost, who is reportedly not fully qualified as a pilot. The last is allegedly interfering in the operations of the SHEFA Provincial Government Council, through his instruction for the Provincial Maintenance Officer in SHEFA Province to be relocated to Pentecost to oversee a bungalow project being carried out by the Chinese Group on the island and that his allowances be paid by the SHEFA Provincial Council. Based on these, the motion calls for the termination of the mandate of Salwai as Prime minister and for parliament to elect a new PM.